The Food and Drug Administrati on — which last year proposed adding a line to the Nutrition Facts label that would break out the amount of added sugar content, in grams — has now also proposed that the label show a Daily Value percentage for added sugars. The FDA is suggesting that the Daily Value for added sugars not exceed 10% of total daily calories. That works out to 200 calories within a 2,000-calorie daily diet, or 50 grams (12 teaspoons). That's the amount of sugar in a 16-ounce can of regular soda; a 20-ounce serving would exceed the maximum recommended intake by 30% (showing a Daily Value of 130%). Earlier this year, the Dietary Guidelines Advisory Committee made the same recommendation regarding added sugars. "Scientific data shows that it is difficult to meet nutrient needs while staying within calorie requirements if you consume more than 10% of your total daily calories from added sugar," wrote Susan Mayne, director of the FDA's Center for Food Safety and Applied Nutrition, in explaining the reasons for the new Daily Value labeling proposal. The Nutrition Facts label already includes Daily Value percentages for sodium, fats, cholesterol, fiber and other nutrients. It also already includes a line showing grams of sugar — but that line is currently inclusive of both naturally occurring sugars and sugars added during processing. The food and beverage industries have been aggressively battling the FDA's proposal to break out the grams of added sugars on the label, which is part of the overall Nutrition Facts label changes proposal that the agency issued for comment back in March 2014. 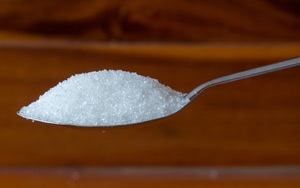 Among other arguments, opponents contend that there is no scientific evidence that there's any difference between natural and added sugars in terms of their effects on the body, and that the current sugar labeling is therefore adequate. Proponents of added sugar disclosures argue that the science showing the dire health consequences of excessive sugar consumption is indisputable, and that the industry simply fears that disclosing amounts of added sugar and recommending daily consumption limits will add even greater momentum to consumers' growing rejection of traditional packaged food and beverages. Indeed, in her Food Politics blog, Marion Nestle -- a professor of nutrition at New York University -- in congratulating the FDA on its new proposal, wrote: "Americans, on average, consume way more than 10% of calories from added sugars, so this recommendation means a sharp restriction. It means consuming less of sugary products: sodas, baked goods, and all those packaged foods with added sugars." The standard period for public comment on an FDA proposal — which goes into effect for the added-sugars Daily Value proposal as of July 27 ­— is 75 days. The FDA is also reopening the comment period for its original draft rule on showing added sugar grams on labels, reported Bloomberg. According to a March 17, 2015 Los Angeles Times article, that original labeling proposal had already generated nearly 288,000 public comments, "including many from major food companies and trade associations." As Nestle wryly noted in her blog, "You can bet there will be plenty" of commentary on the new proposal in the months ahead.